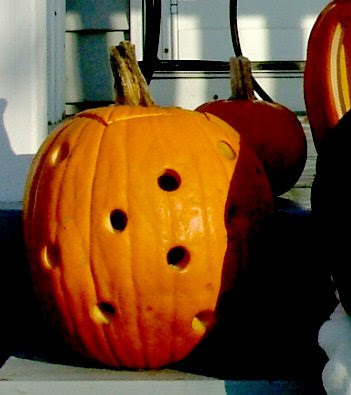 Every year I try to do something different with pumpkins in the fall. One year I carved our house numbers into the pumpkin, leaving just a thin enough layer so the light would glow through. Then I stacked them into a topiary for display on our front porch. (swiped that idea from BHG) All of that carving proved to be too time consuming for me once the little one came along, so last year I got back to my design roots and went for simple patterns. Stripes, dots, etc. I came up with a quick trick for perfect polka-dots. It was fast, simple and easy on mom's hands! 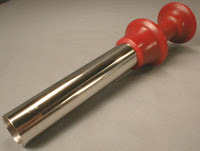 Use an apple corer with a plunger like the one pictured above. It is just sharp enough to cut through the pumpkin and the plunger makes it easy to discard the leftovers. Maybe I'll rack my brain and share some other things that I've come up with in the past. Lack of time and energy have put a halt to my craftiness this year. I'll have to dig in the vault for more ideas from years past.